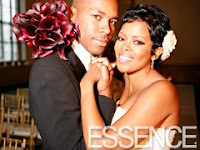 It seems like just yesterday we were telling our readers about actress Malinda Williams' blog over at Essence.com. Well, now we can tell you that Miss Malinda is a Mrs.! She tied the knot with hip-hop icon, D-Nice over the weekend. During her vows, she didn't just say "I do". We love the way our sister said, "I absolutely do!" Best wishes to a great looking couple. See photos of the wedding and reception at Essence.com.